Part Number WB24X830 replaces: 253820, AP2024338, WB24X0800, WB24X0830, WB24X10075, WB24X800. Unplug your microwave before attempting this repair. You will need to remove the grill, which is held into place by two screws at the top of the grill (open your microwave door before doing this). Remove the grill. Remove the screw on the left holding the control panel in place. Loosen the screw behind the panel. You should now be able to lift the panel up and pull forward to detach. 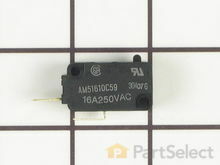 You will find the door switch by removing the screws to detach the switch assembly. Press on the release tab to remove the middle switch. Disconnect the wire connector to release the old switch. The door switch is normally closed. What is the name of the lowest switch on the latch body? I see the secondary switch and the monitor door switch in the diagram, but i don't see the name of the lowest switch. Hi Tom, That is a great question! The bottom switch on the latch body is another Secondary Switch part number PS237421. The top and bottom are the same switch and the middle is the Monitor. Good luck with this repair! I read somewhere that you should make sure the capacitor is discharged before you work on a microwave. How do you find the capacitor and how do you discharge it? Hi Jack, Thank you for your inquiry. The capacitor is found in the back of your microwave. The capacitor is discharged by creating a short circuit between the two capacitor terminals and from each terminal to chassis ground.For the proper procedure to discharge the capacitor, you will need to consult your owners manual. I hope this helps. Thank you and have a great day! My microwave turns on when i open the door. What causes this? Hi Kelly, Thank you for your inquiry. Based on what you described, there are 3 switches in your microwave that you will need to check to see which one is causing the issue. You will need a multimeter to verify which one is the faulty switch. I hope this helps. Thank you and have a great day! I have 3 dor switches on my micro. Looking at diagram, only 2 switches are called out with numbers, door switch #29 (upper) & #30 (middle) in the diagram, they show as two different switches upper wb24x829 and middle wb24x30. No number for the lowest switch. However when i look at the switches on my particular unit, the upper and middle switch are the same and the lower 3rd switch is a different number. What should i order to replace all 3 switches? Which goes where? Follow what is on my unit or per the diagram? The switche have never been replaced. Thanks in advance for the help. Hi Kevin, Thank you for your question. 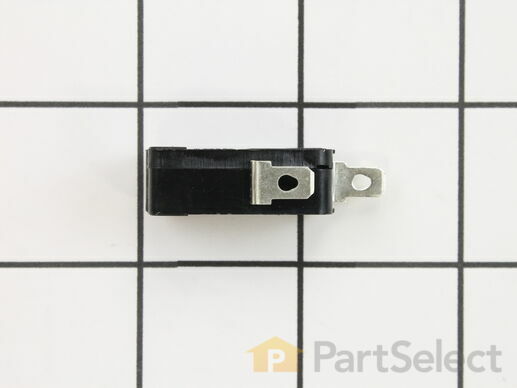 The bottom switch on the latch body is another Secondary Switch part number PS237421. The top and bottom are the same switch and the middle is the Monitor. I hope this helps. Thank you and have a great day! Can I get to the interior light to replace it or do I need a technician to come out and do it? I'd much rather do it myself...but I saw on another site a call needed to be scheduled.Thanks!! Hi Christy, Thank you fort he question. You can do the repair on your own but you will need to be very careful and discharge the Capacitor. It can hold a charge long after the microwave has been disconnected from its power source.You will need to touch the blade of a insulated handle screwdriver to one of the capacitor terminals and hold it there for a few seconds. Repeat this process a few times. Hope this helps! Microwave buzzes when close door. Stops buzzing if left open. Which switch do I need to replace? Hello Dave, Thank you for the question. I suggest testing each switch to see what switch needs to be replaced. The PartSelect Number PS237421 should read Normally Open and the Part Number: PS237422 should read normally closed. Thank you for your inquiry, good luck with this repair! Hello Reinaldo, Thank you for the question. With the information provided, sounds like a stuck keypad, Part Number: PS2374119. The fan button could be stuck on and not allowing it to turn off. This would also explain some buttons working and others not. Hope this helps, good luck with this repair! Microwave stops working and has this electrical hum when the door is closed. It did this once before and we unplugged it over night and then it worked again. Now when we unplug it and plug it back in it still has this electrical hum. Its about 9 years old, is it on its last leg or is there a reasonable fix? Hello Joe, Thank you for the question. I suggest testing the Door Switches Part Number: PS237421 and Part Number: PS237422 for continuity. This is a common issue with a switch issue. Hope this helps, good luck with this repair! Microwave was working fine until one day about 1 min into heating the normal hum and table stopped. Turning off power for 10 min would fix it. Now turning off power doesn’t help. Keypad works fine, microwave light turns on with door open, exhaust still works. It will even count down but no heat. What should i check? Hello Jason, thank you for your question. I would recommend checking the line fuse, the diode and door switches first. If those all test as being working parts, you might need the magnetron. I hope this helps! Where is the interior light located? I swear it has one, but i can't find how to replace it! Thanks! Hi Christy, Thank you for your question. The light bulb should be in a socket located in housing compartment on the inside of the microwave in the top right corner. I hope this helps. Thank you and have a great day! Part was what I ordered. $10 shipping for a micro switch that fit in a standard envelope through the post office. Advertised an average of 1.8 days shipping, but it took 6 days. They are at the high end on prices, and are over charging on shipping. Shop elsewhere unless you like paying a lot and you’re not in a hurry.